Despite the surprising popularity of Splatterhouse on the PC-Engine, Namco ignored this platform for the sequel. With one eye presumably on the international market – where the Mega Drive/Genesis install base was leaps and bounds ahead of the Turbografx-16 – Splatterhouse 2 became a Sega exclusive. This also marked the first time a Splatterhouse game was officially available in PAL territories. Despite the series’ debuting in the arcade, the sequel was exclusive to the home market. With no need for the coin-guzzling of old, Splatterhouse 2’s difficulty curve, whilst still challenging, was more evenly pitched in the early game, only becoming characteristically unfair in its brutality in later stages. The quest for refinement did not cease at the difficulty curve, but rather touched on every aspect of the original’s formula. 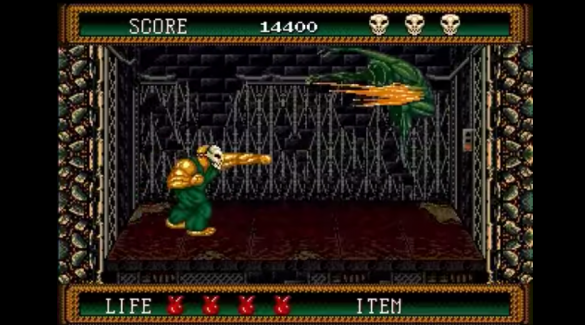 Consequently, Splatterhouse 2 was the logical extension of its forebear in almost every way. Where the first title’s controls were stiff, at times verging on unresponsive, the sequel improves responsiveness and consequently feels fairer when the difficulty does increase. This is not to say Splatterhouse 2 has become Ninja Gaiden. Far from it, there is still a weight and solidity to Rick’s movements that, while sluggish, are merely ‘less sluggish’ than before. Across the game as a whole, the same basic principles remain: Rick walks left-right across one plane of movement, decapitating, splatting, punching and smashing all the gore-swathed horrors standing in his way. This reliance on design decisions made in 1988 has fundamentally hamstrung the sequel. 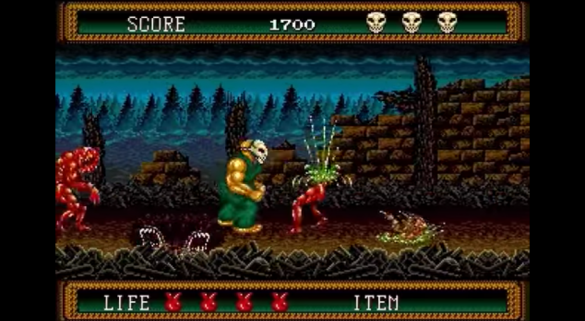 Whilst Splatterhouse 2 is a refinement of the original in almost every way, it takes no cues from other games in the genre. The brawler was one of the most popular styles of games in the early 1990s, Capcom’s Final Fight and Konami’s Turtles and Simpsons games dominated the arcades, Sega’s own Streets of Rage showed the home market was not to be ignored. 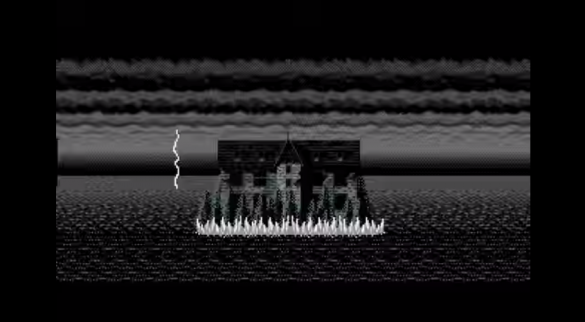 In drawing from such a barren well as the original Splatterhouse, the sequel, for all its improvements, suffers from many of the same long-term problems as the original. With just one plane of movement there is none of the fast, fluid action created in other titles, there is no need to jockey for position, to use combos or to hurl enemies into each other. Rather, motion is comparatively graceless and the move set is limited by the few types of attacks faced from the solitary plane of movement. By the end of the game the restricted, repetitious nature of the play style will be plainly evident, and no amount of gore will be able to hide it. The shock value is dialed-up, specifically, the bosses have become grotesque, putrid creatures. 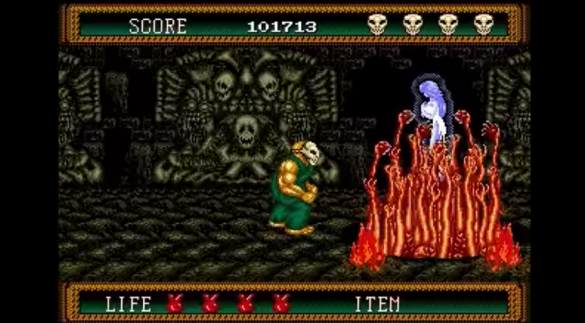 The first Splatterhouse showed a great deal of originality in boss design, including traditional horror elements, such as battles against the contents of a haunted room and a religiously charged inverted cross, alongside gory, gruesome designs. This is no longer the case for the sequel, each boss is more rotten, disgusting and bloodied than the last. Presentation beyond enemy design has also seen evolution. The cinematic influence, so important to the first title, is brought to the fore with movie-style stills used to tell the story. This is a neat touch and is one of the series’ more subtle trademarks. Undoubtedly Splatterhouse 2 is a better game than the original is almost every way. Its main flaw is it does so little new and refuses resolutely to break out of the design straitjacket to where it was condemned in 1988. Such restrictions result in little more than an average game that holds attention through shock value alone, a value with a diminishing return on investment with each use. PAL collectors should beware, as the series’ first foray in 50hz, Splatterhouse 2 is not PAL optimized rendering an already sluggish game frustratingly slow-paced. Fortunately, differences between the US and Japanese releases are merely cosmetic. Fundamentally, Splatterhouse 2 feels like the dim-witted cousin of the brawler family, and merely a curiosity for what used to pass as ‘mature’ gameplay. Sega vs Capcom, Part X: Whuddap, Dawg? !